WHY COULDN’T YOU FIND ME? Was I LOST? Was I INVISIBLE? Was I not destined to feel such emotion…such depth…why were you hiding? Do you not exist? I see you in the lives of others but not my own…I concluded, YOU DO NOT EXIST FOR ME. Love, you have abandoned me and I don’t understand why…can you explain? You do not see. You do not see the beautiful person before you, nor do you see the warmth, grace and light you bring to the world. 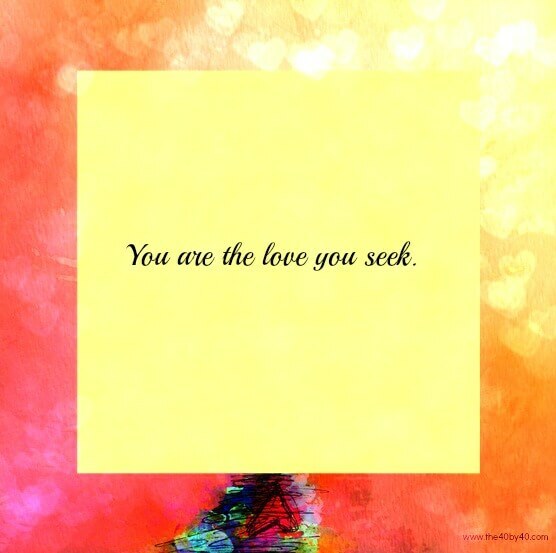 YOU ARE THE LOVE YOU SEEK. LOVE is the essence of who you are…you do not have to search for it…it is already inside you…longing to be shared…yearning to be appreciated…hoping you will recognize it within yourSELF…see it, feel it and then express it…LOVE wants to encompass every thought, emotion and action you create…LOVE patiently waits until you can hear the whispers in your ear…LOVE never left your side because LOVE exists within. Every fibre of your being is LOVE. If we LOVE OURSELVES, the world will love us back…do you understand? My dear, YOU ARE A GIFT OF LOVE. All the love you need exists inside of you and by uncovering, honoring and sharing that deep, unconditional, pure energy it will be reflected back upon you. LOVE is not elusive nor are you unworthy of LOVE’S presence. If the world nurtures the seed that exists in us all, the world would have a garden of kindness and compassion for others to turn to if they lose their way. Once nurtured, love not only exists, it thrives, grows and continues to blossom not only in SELF, but in the hearts and lives of others. TODAY IS A GIFT. TODAY IS A GIFT OF LOVE. HONOR THIS GIFT BECAUSE YOU ARE THE GIFT AND THAT WHICH WE ARE, REFLECTS BACK TO US.